Happy Friday my friends. I can't even explain to you how happy I am that this week is coming to an end. Last Friday, Tyler (one of my toddlers), came down with the flu, then the following day I started feeling under the weather. Add about two feet of snow to the mix, and lets just say it has been a very long week. The good news is that we are both feeling better. However, do to the snow and sickness, I wasn't able to get any new outfit photos taken this week, so today I'm sharing a flashback look from this time last year. Although, besides my hair now being longer, I feel like you would never know these photos were from last year, because I still wear, and love, all of these items! As I recently mentioned on the blog, this time of year is when I start wishing for spring to arrive. To get through the last of these cold months, and cure my winter blues, I reach for the lighter colored clothing in my wardrobe, with blush being my favorite to wear. Although I've been adding blush colored pieces to my closet all year long, there is just something about the color that sings springtime, and lately, it's all that I've been shopping for. I love that I can pair a blush colored jacket, or sweater, with white jeans to get a spring-like look, yet it's still warm enough for this snowy weather. 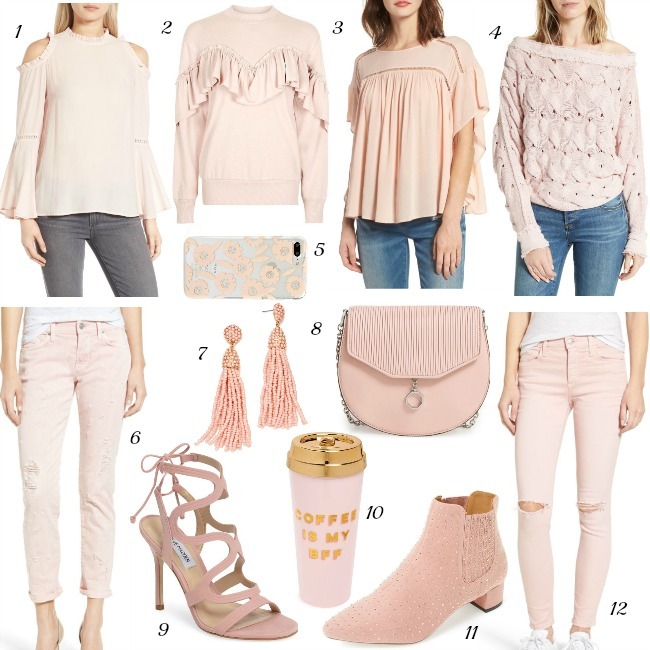 I've rounded up the blush pieces (below) that are currently on my wish list. My only question is, which do I get first? These blush studded booties, or these blush skinny jeans? The feature blogger is Bogi from Hampton Roads. I'm loving her classic, yet stylish fit and flare dress. Make sure to stop by her blog and say hello. Those blush beaded earrings are so, so pretty! I am been going lighter on my mani and also clothes, too! We are getting 70 degree weather here in STL this weekend. I am beyond excited! This is such a pretty look on you! Love your jacket! I'm also loving your picks - those blush booties are fabulous! I am sorry to hear that you have all been feeling yucky, same as our house. I love the flashback look so much and it does make me yearn for spring. I have been trying not to spend money just because but when I feel unmotivated then I want to buy new clothes or get my hair done. Haha. Love the blush pink choice board you've created, I definitely want a thing or two off of your list. Have a great weekend. Such a chic outfit, babe! Hope you get to feeling better soon! Oh yes, blush! I love it. Happy weekend! Glad you are feeling better!! Loving this look! I always love blush for spring! Cutest jacket, and I love those dainty necklaces too. Hope everyone starts feeling better soon! This winter has been a rough one for you guys! Wow, Rachael! This is such a fabulous outfit! 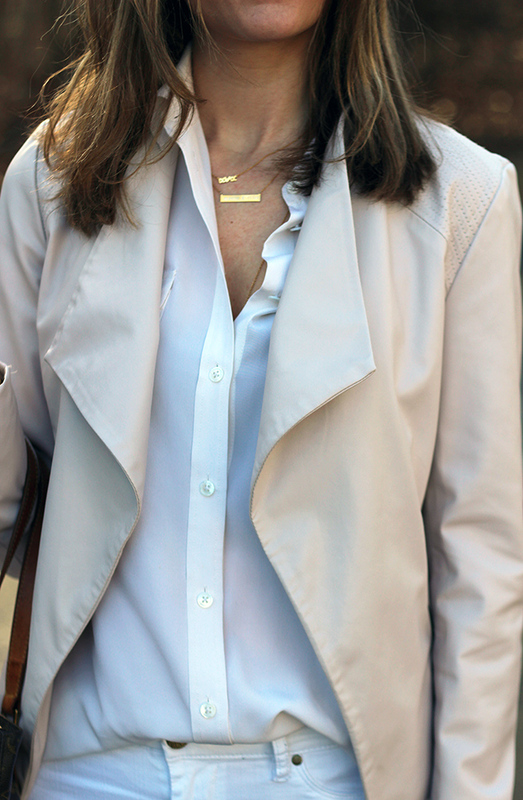 I love all the neutrals and the blush. It looks magnificent on you! Wow!! I really love it Rachel!! Totally wouldn't know it was from last year! I was thinking I should recreate this. I have that jacket and it's still a favorite. Glad you both are feeling better! I would have never known these photos were from last year. I love the look! Sorry to hear you have all been under the weather and been dealing with so much weather. Hope you can enjoy the weekend! So sorry you and Tyler have been sick, but I'm glad you are feeling better. I would have never known that the photos were from last year! Great look! Hope everyone will be all better real soon! I really do not know what more I like about your look. Everything is so perfect that it is difficult to choose. 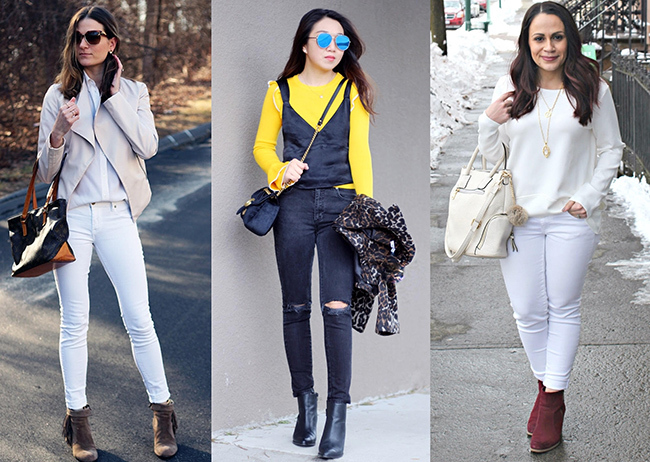 Fantastic white skinny jeans. Amazing booties. Incredible jacket. Adorable shirt. I think you should get both. Blush is so in and both the boots and the jeans will look gorgeous on you! Blush is the prettiest color!!! Love your entire look. Happy Weekend! Love the whole look. Such a great all white look! Love this look! Perfect winter white! You look so pretty darling! Very nice photos and outfits!